As it has been many years since the AIC had a gallery devoted to Art Deco objects, we will therefore be sharing with our audience treasures from the crypt (ie. storage). Many of these objects were acquired close to the time of their manufacture, either by the Art Institute or some of its more Avant-garde patrons. The one exception is French, English, and American miniature rooms created under the supervision of Mrs. Thorne for her world-renowned survey of European and American period rooms in miniature which have been almost continuously on view since 1941. 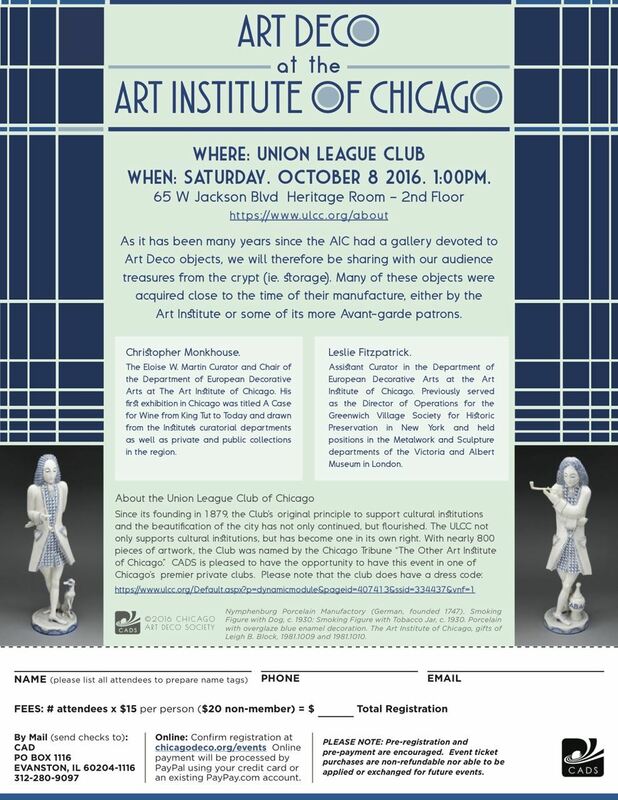 Art Deco has had a recent boost thanks to a significant gift to the Art Institute by Judy and Joe Fell. In glass, ceramics, metalwork and wood, these objects were acquired by the Fells from local auction houses over the past 40 years. While virtually none came with specific provenance, the fact that they were bought in the vicinity of the Windy City provides a more comprehensive overview of Chicago’s taste for Art Deco than previously possible here at the Art Institute. Christopher Monkhouse majored in art history at the University of Pennsylvania (1965-69) and was awarded a Thouron British American Fellowship to study at the Courtauld Institute of Art in London, where he received his MA in 1970 for a thesis on British railway hotels. Whilst living in London he set up a program for the Associated Colleges of the Midwest called Arts in London, before returning in the fall of 1975 to serve as a visiting lecturer in art history at Brown University. In the summer of 1976 he moved his office down College Hill in Providence to the Rhode Island School of Design where he served as curator of European and American Decorative Arts for the next 15 years. In 1991 he moved to Pittsburgh to serve as the founding curator of the Heinz Architectural Center at the Carnegie Museum of Art. In 1995 he moved to Minneapolis to take the post of James Ford Bell Curator of Architecture, Design, Decorative Arts, Craft and Sculpture, which he held until 2007 when he moved to Chicago to take up his current position as the Eloise W. Martin Curator and Chair of the Department of European Decorative Arts at The Art Institute of Chicago. His first exhibition in Chicago was titled A Case for Wine from King Tut to Today and drawn from the Institute’s curatorial departments as well as private and public collections in the region. In 2015 he curated the much-acclaimed Ireland: Crossroads of Art and Design, 1690-1840. Leslie Fitzpatrick is Assistant Curator in the Department of European Decorative Arts at the Art Institute of Chicago. Leslie received her B.A. in Metropolitan Studies and Art History from New York University and her Master's Degree in the History of Fine and Decorative Arts from the University of Glasgow at Christie's Education in London. Prior to arriving at the Art Institute she served as the Director of Operations for the Greenwich Village Society for Historic Preservation in New York and held positions in the Metalwork and Sculpture departments of the Victoria and Albert Museum in London. Along with Christopher Monkhouse, she worked on the AIC’s recent exhibition Ireland: Crossroads of Art and Design, 1690-1840, serving for over five years as the project’s Assistant Research Curator. Nymphenburg Porcelain Manufactory (German, founded 1747). Smoking Figure with Dog, c. 1930. Porcelain with overglaze blue enamel decoration; 54.6 x 15.9 x 15.2 cm (21 1/2 x 6 1/4 x 6 in.). The Art Institute of Chicago, gift of Leigh B. Block, 1981.1009. Nymphenburg Porcelain Manufactory (German, founded 1747). Smoking Figure with Tobacco Jar, c. 1930. Porcelain with overglaze blue enamel decoration; 54.6 x 19.1 x 15.2 cm (21 1/2 x 7 1/2 x 6 in.). The Art Institute of Chicago, gift of Leigh B. Block, 1981.1010.